Inference is a very important subject in the traditional Indian pramANa-SAstra. It is a logical process of arriving at cognition of something unknown from the known. All schools of Indian philosophy, except the skeptic cArvAkas, accept inferential cognition as a kind of cognition. Inference, and its constituent pervasion, has been a favourite subject of the Indian logicians, the naiyAyikas. Several volumes of terse treatises have been built on dialectic format with this subject. While most schools of Indian philosophy fall in line with the nyAya theories of inference, with minor digressions here and there, the dvaitins’ contribution in infusing fresh thought and approach in arriving at some practical and original doctrines on the subject is notable. 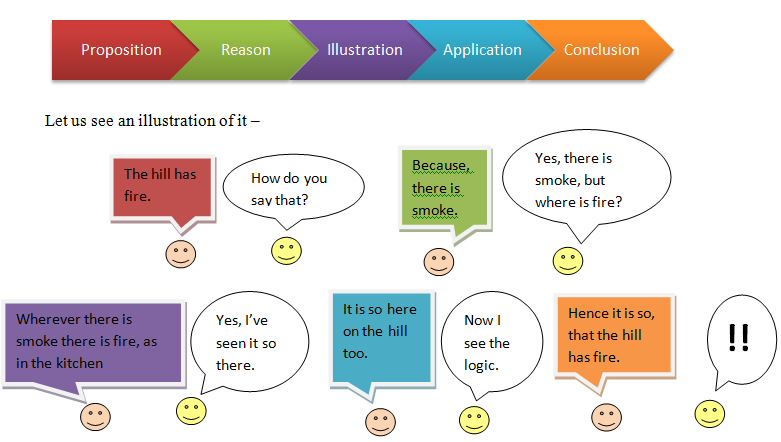 In this article an attempt is made to present the rather difficult epistemological subject of inference with simple illustrations of common experiences so that the reader may be able to connect to the subject, and not be put off by its cumbrous nature. Rarely does a mother miss to decipher the cause of her infant’s wailing. Every time the door bell or the phone rings we cognize – there is a person whom we have to attend to. This happens, in spite of the fact that the person is not directly perceived by us. Even birds and animals sense natural calamities by some signs and show reactions of anxiety even before the catastrophe strikes. These instances are not mere assumptions, presumptions or coincidences, but are definite knowledge of the things that are not directly perceived! The intelligence in the beings is attributed to the capacity of arriving at and using this knowledge to survive, deal situations in life and excel. This ‘looking beyond the obvious’ knowledge is sometimes referred to as ‘presence of mind’, ‘logical thinking’ etc. All of us go through experiences of the following sort – when we perceive something or hear or read something, we are sometimes invariably reminded by it of a second cognition that is intimately connected with our first one. The object of the second cognition need not quite be available for immediate perception. Yet, the cognition of it is very definite. For instance, if we were travelling from some place to our destination and find on reaching it that the roads, the ground, the rooftops and trees etc are wet. We immediately understand that…. that… that… yes, that it has rained previously, though rain is not perceived at the instant. How do we arrive at this conclusion? By past experience we know that when it rains, all unsheltered places coming into contact with the rain become wet. That is, if there is widespread wetness, it is due to a previous rain. Thus, when we see wetness around, we are immediately reminded of the rain of an earlier time, both of which are invariably connected. The cognition of rain sans direct perception of rain is not a mere assumption, but a definite cognition deduced by a decisive intellectual process called inference. What it gives rise to, is inferential cognition. In inferential cognition, that which is sought to be proved or arrived at is called as the ‘probandum’. That which proves it or is the cause of the inferential cognition is the ‘reason’ and being so, it is also termed as ‘inference’ – the instrument of inferential cognition. The reason is ‘cognized’ and through the recollection of its invariable relation with the probandum the probandum is ‘inferred’. The location where the probandum is sought to be proved to exist is called as the ‘subject’ of inference. The infallible or unfailing relation between the probandum and the reason is called as ‘concomitance’ or ‘invariable pervasion’. Inferential cognition is a complex cognition resulting from the knowledge of undisputed pervasion between the probandum and the reason on the one hand and the knowledge of the reason existing on a subject on the other. On the basis of these two cognitions, deduction is drawn regarding the existence of the probandum on a subject,based on the reason. For instance, when smoke is seen emerging from, say the invisible side of a hill, the inferential cognition that is deduced is – ‘the hill has fire’. The reason which leads to this deduction is the cognition of smoke on the hill and the prior knowledge that fire pervades smoke. That is, the cognition of pervasion between smoke and fire is – ‘wherever there is smoke there is fire, as it is the cause of smoke, as in the case of kitchen fire etc’. On the sight of smoke on the hill the recollection of this pervasion happens and the conclusion is arrived at as ‘since there is smoke emerging from the hill, there is fire on it’. anumiti-karaNam anumAnam. parAmarSa- janyaM jn~Anam anumitiH. vyApti-viSishTa-pakshadharmatA-jn~AnaM paramarSa. yathA vahnivyApya-dhUmavAn ayaM parvataH iti jn~AnaM parAmarSaH. tajjanyaM parvataH vahnimAn iti jn~Anam anumitiH. yatra dhUmaH tatra agniH iti sAhacarya-niyamaH vyApthiH. vyApyasya parvatAdi-vRttitvaM pakshadharmatA. – The instrument of inferential cognition is inference. The cognition generated by consideration is inferential cognition. Consideration is the cognition of (the pervader) as being present in attribute of subject (which is) distinguished with (cognition of) pervasion. For instance, the cognition as ‘this hill has smoke pervaded by fire’ is consideration. The cognition generated by it as ‘the hill has fire’ is inferential cognition. Pervasion is invariable concomitance (such) as wher(ever) there is smoke there is fire. The location of the pervaded on hill etc (subject) is ‘being present in attribute of subject’. – tarkasan`grahaH, annambhaTTa. Thus, the knowledge of pervasion and the cognition of the reason on a subject are the preconditions for inferential cognition to arise. Most schools of philosophy fall in line with the theory that the subject is the common ground of both the probandum and the reason, except the dvaitins. They do not subscribe to the idea that inference is based on one subject being the common ground of inference for both probandum and reason. It is seen that even while being in different loci, they can give rise to inferential cognition, as in the instance of inferring from the floods on the ‘plains’ now that there was rainfall on the ‘mountain’. Hence, according to them, cognition of the reason in an appropriate place and during appropriate time along with the knowledge of pervasion can give rise to inferential cognition. Pervasion – The indispensable relation between the pervader (probandum) and the pervaded (reason /mark) is pervasion. It is on the basis of this relation that the confirmed cognition of the probandum arises in a subject suspected of having the probandum. Since pervasion is grasped by looking at many or some instances of the relation between the probandum proposed and the reason deemed elsewhere, it takes the support of an illustration to confirm the cognition. For example, the fire from firewood in the kitchen, which has pervasion with smoke, is an illustration, already well known to the cognizer, on the basis of which the cognition of fire on the hill is confirmed. sandigdha-sAdhyavAn pakshaH – Subject has probandum that is suspected (being there). – tarkasan`grahaH,annambhaTTa. The probandum is termed as the pervader in an uneven pervasion, as it has wider pervasion than the reason, which is the pervaded entity in the pervasion between the two. In our considered illustration of fire and smoke, fire exists in every smoky instance, like in the kitchen, in the ritual of sacrifice in fire, in an incense stick, in a cigarette(!) etc. 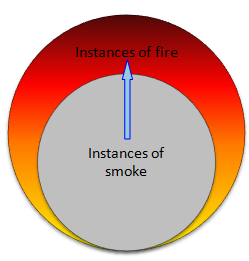 Smoke does not exist in every instance of fire, like in live embers, in a gas stove, in dry firewood and so on. The pervaded (smoke) qualifies to be the mark of inference of the pervader (fire) on the subject (hill) and not the vice-versaas fire not being pervaded by smoke always (unless and until conditioned by wet fuel), need not be an instrument in the cognition of smoke. In case of even pervasion between two entities, on the other hand, each one can act as the probandum and the reason alternately, subject to the cognizer’s consideration of which is being taken as the pervader and which the pervaded. For instance, nameability and knowability have even pervasion. All that is nameable is knowable and all that is knowable is nameable. For example, a pen is nameable and knowable. So are all objects of the world!Here, while one is considered as the reason, the other would be the probandum and vice-versa. Kinds of inference – Based on the person in whom inferential cognition arises, inference is classified in to two types – inference for oneself, for the sake of others. Pervasion is the life of inferential cognition and rightly termed as its instrument. Grasping the pervasion and recollecting it in the relevant context is all it takes to give rise to the ‘magical’ cognition of that which is ‘beyond the obvious’. Comprehending the unfailing relation between two things is grasping their pervasion. It is through this that between the two entities, the directly unknown entity in pervasion is logically derived in a context through the direct cognition of a known part of this unfailing relation of pervasion. But at the outset, it is essential to know how this pervasion is grasped at all. Inference for oneself – The invariable relation between two entities cannot usually be grasped in a single instance. And unless and until it is ‘known’ it cannot give rise to inferential cognition. For instance, by common experience we all know that fire is associated with heat and resist directly touching naked fire. But a baby, not knowing the invariable relation between heat and fire attempts without hesitation to touch it. So elders run behind it to desist it or, it becomes wiser once it actually burns its fingers! With every consequent attempt it only gets wiser! There are two factors which affirm the relation between the pervader and the pervaded to be invariable. They are – repeated cognition of their co-occurrence and lack of cognition of even a single instance of exception of co-occurrence. The conclusive comprehension of the invariable nature of co-occurrence between the pervader and the pervaded is indeed the grasping of pervasion. These factors also ensure the cognition of which among the two co-occurring entities is the pervader and which the pervaded. When a person on her own comprehends the invariable relation between two entities by observing their co-occurrence in more than one instance, without any exception, and applies it in arriving at some inferential cognition through recollection of the pervasion, it is considered to be an instance of inference for oneself. 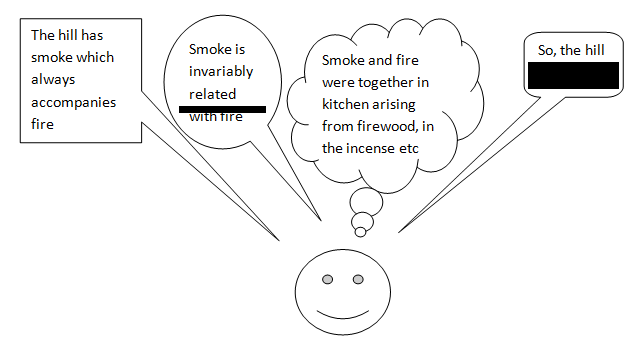 If we take the classical example of inferring fire on the hill by seeing smoke there, a person is able to make this inference only on the basis of the cognition of the invariable pervasion between smoke and fire. This is grasped, as mentioned earlier, by looking at their co-occurrence in places like the kitchen where firewood is used, in a fire place, in an incense stick etc. This is further strengthened by not coming across even one occasion of exception. In this way, the pervasion having been comprehended is recollected at the time of seeing smoke emerging from the unseen side of the hill. And lo! Fire in inferred on the hill. Inference for the sake of others–When a person who already has the knowledge of the invariable pervasion between two entities, uses syllogism to convey it to others, thereby causing inferential cognition relevant to the pervasion to arise in the other person, it is considered to be an instance of inference for the sake of others. The schools of mImAMsakas and advaitins consider that either the first three or the last three parts of syllogism are sufficient in giving rise to the final cognition. Dvaitins take a more practical stand and say that there can be no condition on thenumber of parts that the syllogism will require to give rise to the final cognition. It entirely depends on the capacity of the speaker to convey and the capacity of the listener to understand the logical process. It may get over in a single utterance or could take seven, ten more parts, if required. When two things are invariably co-existent then their absences would also be related with each other, invariably. The pervasion is considered to be negativewhen the pervasion between the absencesof probandum and reason is considered in giving rise to the final cognition and positive when otherwise. However, in the negative pervasion the roles of pervader-pervaded get reversed. Wherever there is absence of fire there is absence of smoke, as in a lake. In the instances where pervasion of the absences of the probandum and reason is not available or a negative illustration is not available, there can only be positive pervasion giving rise to the final cognition. Take the case of nameability and knowability. They are equal is pervasion. An inference like – a table is nameable because it is knowable, like a chair – can give rise to the cognition that ‘A table is nameable’. There can be no pervasion between absence of knowability and absence of nameability as absences of nameability and knowability are non-existent. This is because all objects of the world are nameable and knowable. So, there can be no illustration of a thing that is ‘not nameable’, and surely not ‘not knowable’! Then it could not even end up being an illustration! In the instances where pervasion of the probandum and reason is not available or a positive illustration is not available, there can only be negative pervasion giving rise to the final cognition. For example – ‘A living body has a soul because its vital airs are functional.’ Consider this inference. The inference – whichever entity has functional vital airs has a soul – needs to be confirmed with an illustration. This is possible only in case of a live body. But that happens to be the subject of inference where the probandum is intended to be proved with an illustration. There can be nothing else to provide for a positive illustration. This can however, be negatively illustrated as follows – whichever entity does not have a soul does not have functional vital airs, like a log of wood. Through this the final cognition could be reached. This is an instance of inference with only negative pervasion. The dvaitins, here again differ and opine that negative pervasion is superfluous. According to them the pervasion is only between the probandum and the reason. It is only that an illustration to confirm the same is in the wanting. To prove the pervasion, the absences of the probandum and the reason are shown to co-exist through an illustration. As a matter fact, even in such a case, the pervasion does exist, and positively so, as the absences of probandum and reason are considered in such inferences, and not the absences of the pervader and the pervaded! This may sound a little tricky, but a look at the table above may simplify the complexity. So, the question is how come pervasion, a relation between the pervader and the pervaded be a negative one? Let us directly see some illustrations of other types of inferences. Counter factual reason – This is called as tarka in the traditional epistemological terminology. This usually is used in an argument. When an adamantopponent proposes something contradictory to logic, she may be countered by supposing her view to be true, while showing the eventual logical conclusion it would lead to, that will be undesirable for her. That way the opponent is forced to accept that the stand counter to her proposition was right. Opponent – The hill does not have fire. Proponent – If there were no fire on the hill then there would be no smoke too. Opponent – In that case, I agree that the hill has fire. Here in the inference, there is pervasion between the supposition of absences of fire and smoke as the pervaded and pervader, respectively. Again, in case of counter factual reasoning the naiyAyikas and the dvaitins have different points of view. The naiyAyikas consider tarka to be erroneous cognition as it supposedly denies what is practically existent. In the given instance, smoke is existent on the hill and is visually perceived. In spite of it there is a supposition of its non-existence as ‘there would be ‘no smoke’’. It is so in the case of the firealso. Since the cognition involves non-real supposition, tarka happens to be erroneous. The dvaitins refute this and consider tarka to be a constituent or an instrument of inferential cognition. They say, when we are considering the absence of smoke, or for that matter fire, we are very much aware of the fact that it is merely a supposition. And also, the objective is not to arrive at erroneous cognition, but to true cognition of fire on the hill. tarka would have been erroneous provided it did not land itself in refuting the supposition. But it does do that. Rather, it is meant to do that! Having done that, the supposition of non-reality in tarka stands nullified. So, it cannot be erroneous. The foregoing passages have been deliberations on inferential cognition in the form of true cognition. However, like all things in the world, things might go wrong with inferential cognition also! We have seen that arriving at inferential cognition is quite a complex process. There could arise several errors at the various stages of its processing or even at the arrival of the final cognition, though there were no processing errors. Wherever the error be, it is the inference that is termed as fallacious as – if the effect is erroneous, there has to be a cause for it. Inference, and specifically reason, being the instrument in inferential cognition is the one that takes the blame of being erroneous. It would actually take an entirely separate unit to cover the details of fallacies of inference. However, as they are related to this topic, we just mention the basic fallacies and conclude this article. Logic is a subject of intellectual debate. Hence there is a detailed discussion on grounds of defeat in debate in the analysis of inferential cognition too in all schools of Indian philosophy that would make for an interesting discussion. Tarkasangraha, Annambhatta, edited by Yashwant Athalye and Mahadev Bodas, BORI, Pune, 1963. The path of proofs Pramanapaddhati of Sri Jayatirtha, English rendering by Dr. Shrinivasa Varakhedi, Dvaita Philosophy Research Centre, Manipal University Press, 2011.